We really were in the greater Phoenix area all day. The morning was pleasant, with light clouds to keep things cool. Warren had decided to ride the first 30 miles with the group, which was a special treat. We headed east from the hotel, enjoying the urban environment. 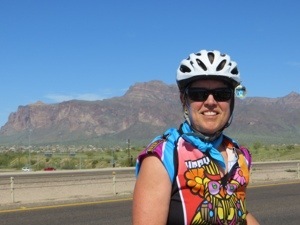 We biked through Paradise Valley (very upscale), and into Scottsdale. We joined a bike trail paralleling Hayden Road, with ponds created by the Indian Bend Wash. 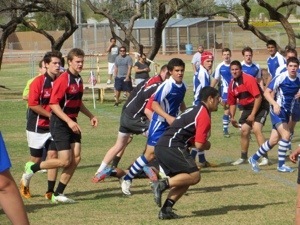 There were also playing fields, including some high school rugby. What a coincidence that my son Tim was refereeing a game back in Indianapolis at the same time. Guess I am just a rugby groupie! At 30 miles, Warren and I turned west into Mesa, so he could catch the light rail back toward Sun City. 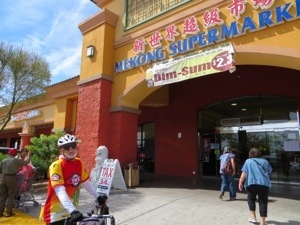 He mentioned a nearby Asian market, and I was quickly drawn to explore. I had to rub the tummy for good luck. 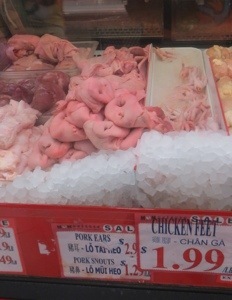 Although tempted, I opted not to buy pig’s snouts for Linda to fix for dinner! Hated to say goodby to Warren – great that the light rail can accommodate bicycles. 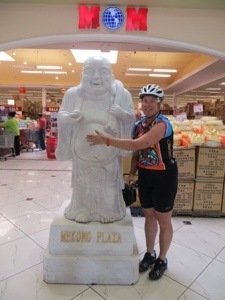 Continued the rest of the ride on my own, enjoying this statue in Mesa. 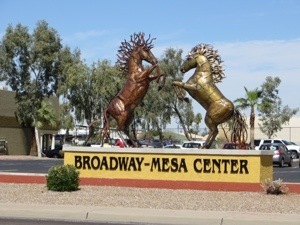 Mesa is more of a middle class area than those we rode through earlier in the day. As we pedaled east, the road was more ruted, and more trailer homes. But ahead we could see the Superstition Mountains. Sadly, the final 6 miles of the day was along US 60, partially a freeway, then a divided 4-lane road. The shoulder was fine, and there were few trucks. Several of the cyclists ran into traffic headed to the Renaissance Faire just down the road. The cyclists were moving faster than the car traffic. I only saw some of the “actors” in the hotel corridor. 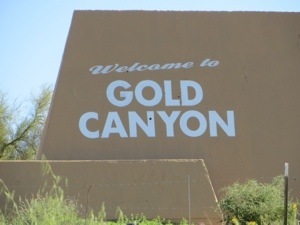 Our hotel is the Best Western in Gold Canyon, though our itinerary shows Apache Junction. 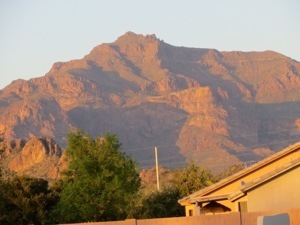 At dinner we enjoyed the sunset shining on the mountains. We need a good sleep tonight for big climbs to Globe tomorrow. My roommate tonight is Helen Pagenkopf, from Wisconsin. She is a retired registered financial broker with 2 sons and 2 grandchildren. 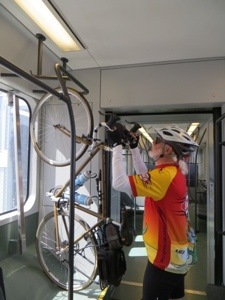 She has ridden 16 times across Minnesota on the MS TRAM. My bike is stored in a hotel conference room, so I don’t have the day’s mileage. I do know I have ridden over 500 miles so far, combined cue sheet and ‘bonus’ miles. I love your curiosity and willingness to follow where it leads you! I gave the link to this blog to a dear friend who will accompany me on a similar tour in 2 years time. Her name is Sherry Johnson, a fellow cyclist and not a troll. Did I mention how inspiring you are!!!? Great to see you with Warren, and know he’s really back in the saddle! Who are your guides? Linda…Baldwin? She was mine in Glacier. Tell her hi. Golly Dolly, it’s 37 overcast and a little windy today. We miss you being here for the ride today. Dolly, I find myself looking forward to reading your daily posts. You are experiencing the country the way a bike tour is intended, not just looking at the center line on the road. Keep it up and enjoy..
You are doing such a great job with this blog! 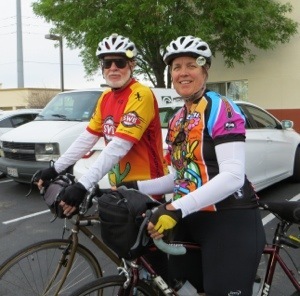 Your descriptions are conjuring up all sorts of memories for me–I recall riding into Phoenix with pal Hille in 109 degree heat. Your photos are great. Keep enjoying the terrific experience! Happy St. Pat’s Day – hope Linda had a special stew for dinner! 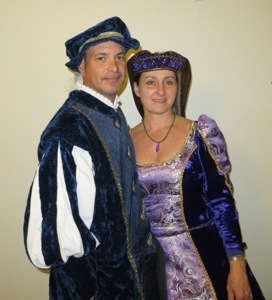 Thoroughly enjoy reading your posts, and am quite envious. You have mentioned two riders who are age 70 or better. I had planned to do a southern route c-to-c when I turned 70 last year, but never got it put together, last year or this year. So I guess I’ll have to wait ’till next year. But your journal definitely gives me incentive! BTW, when you rode thru Phoenix, did you get accosted by any javalinas? They’re rampant out there (also in southern TX). Couple years ago I was riding in Scottsdale and one ran across the road right in front of me…if you hit or get hit by one, they’re definitely big enough to ruin your day!